It is Thomas Lee’s mission in life to lure his former countrymen (and women) away from their Korean homeland to the little island of Tasmania – but only for a short time. Thomas’ desire is all in the line of business as he is the only registered Korean travel agent operating in Australia’s most southerly state. Born and raised in Seoul, where he obtained a Bachelor of Tourism Studies degree from the Korea National Open University, Thomas has been involved in the tourism industry for 14 years. It was while operating his own travel business in Seoul that he began to develop a keen interest in Australia arising from both his own stays there and the increasing number of Koreans who approached him to book a vacation. Following his marriage to Rita in 2001, he decided to move to Australia to raise a family and further develop his career. “By that time I had a pretty good knowledge of the Australian travel market and had cultivated a wide network in Australia” he declares. “But at first I couldn’t decide just where to live.” As most Korean travelers favoured Brisbane, Sydney and Melbourne as holiday destinations, these cities seemed to be the most obvious. It was while assessing the travel market in Brisbane that he made a trip to Tasmania and fell in love with the island’s natural environment and relaxed lifestyle. Besides, there were no other Korean travel agents operating in the Tasmanian market. However, the task ahead for Thomas was daunting. 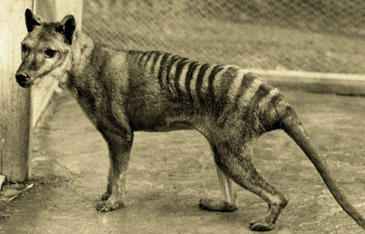 Tasmanian tiger: The thylacine was the largest known carnivorous marsupial of modern times. It is commonly known as the Tasmanian tiger or as the Tasmanian wolf, according to Wikipedia. Native to continental Australia, Tasmania and New Guinea, it is thought to have become extinct in the 20th century. The strength of both the Australian dollar and the $US (in which most holidays are priced), in relation to the value of the weakening Won, does not make for an attractive exchange rate for Korean travelers. This, and other influences, has seen the number of Korean visitors to Australia fall from 211,900 in 2004 to 180,000 by 2009, a decrease of some 15%, while those opting for a Tasmanian vacation during 2009 is 3000, similar to the numbers recorded in 2006. Another compounding factor facing Thomas is the tradition that most Koreans are prepared to allocate only 5/6 days to an Australian vacation focusing the bulk of that trip either on Sydney, or Brisbane and the Gold Coast. This leaves little time to see any more of the enormous continent, never mind its most southerly, and smallest, offshore State. 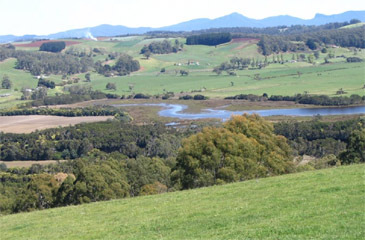 “Tasmania was largely unknown to the bulk of the Korean population”, declares Rita. “And those who do know about it think it’s like Jeju Island”, adds Thomas. While there are similarities, both islands have a population of about 500,000, however Tasmania is some 50 times larger than Jeju. So initially, Thomas had to set about how to introduce the island to Koreans, dispel any myths, and then acquaint potential visitors about its attractions and demonstrate sound reasons to visit. Last year he planned and coordinated a visit to Tasmania for the Korean Broadcasting System (KBS) to produce a four part documentary entitled ‘Mountains’. This featured well known actress, Lee, Ye-rim, and highlighted Tasmania’s pristine highland environment. Currently, Thomas is hosting an Educational Broadcasting Service (EBS) television crew for a two week period to capture and present other island attractions. These include some of Tasmania’s National Parks, its historic villages, natural wildlife (including the Tasmanian devil), iconic Cradle Mountain and the old penal settlement of Port Arthur. In addition, the shooting schedule will include interviews with a number of Tasmania’s inhabitants to learn something of their lifestyle and what they find attractive about where they live. This feature is scheduled go to air in Korea, in four, 40 minute episodes later this year. While television exposure may assist Thomas in his quest to attract more Koreans to Tasmania, perhaps his greatest assets may already be in place. The University of Tasmania traditionally attracts hundreds of Korean students each year to its undergraduate programmes, to study for doctorates and undertake post-graduate research. In addition to Korean University staff, there also exists a strong and energetic Korean community in Hobart with three vibrant Korean churches, two Korean restaurants and a number of Koreans who have established thriving businesses. 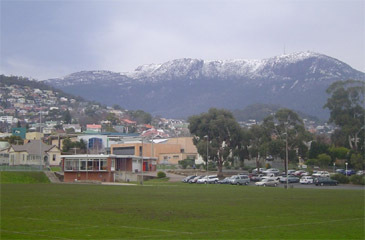 Hobart is also a favourite training base for Korean hockey squads and recently hosted a three match international series between the Korean men’s team and Australia. Over the past six months there has been talk of building a Korean ‘village’ in the eastern suburbs. However, ‘word of mouth’ from current long/short stay migrants and permanent citizens, about the relaxed, unhurried, Tasmanian lifestyle may prove to be the most persuasive endorsement of the State in relation to future tourists. “I would like to develop a special travel product to show Koreans a relaxing time when they visit Tasmania”, states Thomas. In his sights are niche holidays, such as bushwalking, golfing, visiting historical sights and wildlife safaris. While the traditional sightseeing is not to be discounted, Thomas, with his extensive knowledge of the State, is prepared to work with individual clients or groups to plan, guide and lead, specially crafted leisure experiences. “I am so proud of Tasmania I want to share it with others”, he declares enthusiastically. And living in such an attractive, unhurried environment, who can blame him?